Successfully Added Ulefone S7 Android Smartphone - Android 7.0, Quad-Core CPU, 5-Inch Display, Dual-IMEI, 3G (Black) to your Shopping Cart. The Ulefone S7 is an affordable Android phone that smoothly lets you enjoy all the basic cell phone features. This cheap smartphone runs on an Android 7.0 operating system that puts forth a lag-free user experience. Thanks to this, you’ll be able to enjoy the latest smartphone features the industry has to offer. Along with its Quad-Core processor and 1GB RAM, it lets you play basic games, watch movies, and engage in Android applications. 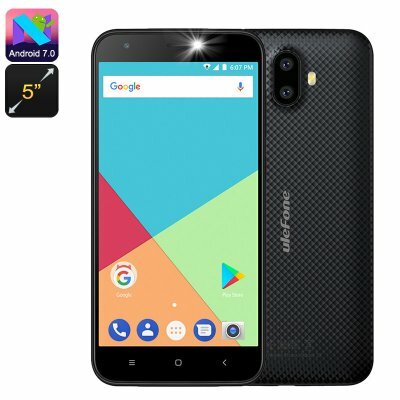 If you’re looking for a cheap Android phone to meet your basic needs, the Ulefone S7 is perfect for you. This Android smartphone features Dual-IMEI numbers. Thanks to this, you’ll be able to slide in two SIM cards and stay connected to both at the same time. This means that you’ll always be reachable on two phone numbers while using only one device. To further increase your connectivity, this Android phone supports 3G. From now on, you’ll be able to access the internet no matter where you’re at. Along with its 2500mAh battery, this smartphone packs enough juice to get you through a days’ worth of usage time. On its beautiful 5-Inch display, this Android smartphone allows you to enjoy all your favorite media in crisp 720p resolutions. Simply head out to the Play Store to acquire the latest media of your liking. The phone treats you to 8GB ROM and an SD card slot that supports 128GB external memory. Therefore, you’ll never have to worry again about running out of storage space for all your files and media. With this cheap Android phone at your side, you’ll be able to stay connected and entertained throughout the day without needing to spend a large sum of money. The Ulefone S7 Android smartphone comes with a 12 months warranty, brought to you by the leader in electronic devices as well as wholesale Android phones..